Greetings, pilots! We're excited to launch into a new season of work by putting an idea on the table in front of you: Reversible cards with all-new back-facing art to take you deeper into the action. 2.0 — with its revised maneuvering, combat, and abilities — is the biggest, most exciting change to X-Wing yet. As many fans have mentioned, updating our layouts to keep up with the new card format is relatively simple. However, we thought we'd take the chance to actually spend some time away, pausing to look at our work and art-direction with fresh eyes. AllWings started life as a personal hobby we barely knew how to share, much less sustain! Many of our design and style decisions were made with little more consideration than "that looks cool". But today, almost one year on, it's time for us — too — to update. This starts with our brand new card backs. 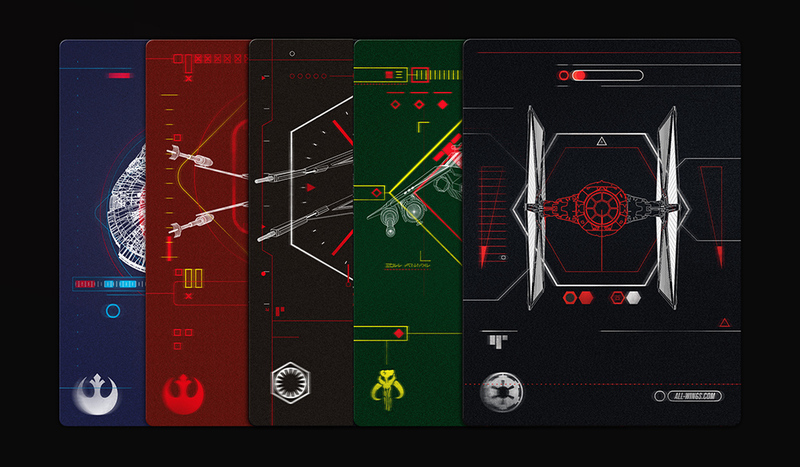 [Above] Our original, classic nebula faction card-backs. We're real proud of these, but progress trumps sentiment! We pride ourselves on bringing the universe to life on the tabletop — making each game more storied, immersive, and visually stunning. To that end, we've had a good long think about our cards as a format, and what more they could do deliver an enhanced game experience. With the Active Back System, we plan to make not only the front-facing art that you know and love, but also the backs of every card into a part of the game and your in-universe immersion! Whether you're chasing down Rebel scum, taking the fight to the Empire, or profiteering as a merc in-between, galactic warfare is fraught with danger and destruction. Inevitably, every pilot meets his match, and ships go up in great wreaths of fire. Having our cards reflect the changing elements and pieces on the battlefield is an idea we've long bandied about, but never quite found the right execution for. With 2.0, we're finally putting it on the table. On top of a refreshed look and feel on the front (and higher-fidelity art than ever), each and every pilot card will now feature a special card-back. These will be unique per faction and ship! More importantly, we've developed a telemetric-readout visual system that allows each card-back to represent the ship destroyed / out-of-commission. This means that when your ship gets taken out of action, you can flip your card over, and it'll visually reflect that in a realistic, universe-appropriate way! This comes with a slew of neat advantages. Thematically, we can now deliver a visual representation of the action on the battlefield — making full use of the card format to make piloting your list ever more immersive and unique. With upgraded edge-to-edge art on the front and unique Active Back Systems, there's a whole lot more Star Wars to go around. Logistically, it also helps visually de-clutter the table by differentiating between ships still in the fight and those blown to dust (which we hope proves helpful to streamers, newbies and just about everyone who needs to read the table quickly)!